Detroit and its surrounding areas are littered with Irish pubs and restaurants that go all out for St. Patrick's Day! Stop by the annual St. Patrick's Day Parade in Corktown in the afternoon, and then head out to your favorite bar for their festivities. If you're feeling ambitious, crawl around to all of the bars in the area. If you are in the suburbs, you will still find plenty of bars open for business all day long! You will find excellent specials no matter where you go, and you will definitely get your fill of green beer! 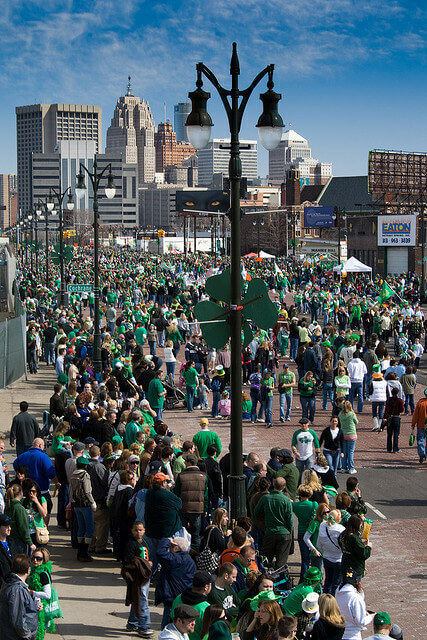 There are so many places to go and things to see when St Patricks Day strikes Detroit. Whether you're a drinker or just someone who likes to take part in festivities, there's surely an activity for you to enjoy in the area. With a professional mode of transportation such as a limousine or a party bus, your St Patrick's Day will feel infinitely more lucky. With a professional mode of transportation such as a party bus or a limousine, all of your worries can go out of the door. You'll already have a designated driver behind the wheel who has recommendations for all of the best bars and nightclubs in the area. You can enjoy neon lighting, wraparound leather seating, ice filled bar areas, and an amazing sound system.